No. I. The Aquarium Simplified. [NOTHING more bespeaks the presence of true taste than the appearance of a nicely adorned home. The wealthy frequently surround themselves with gardens, books, and pictures, more as the devotees of fashion, than from a native love for all or any of these things. But when we see a man of scant income afford himself a little out of this for a root of some choice flower, or for some improving book to his library, or for anything that may be fairly separated from the sensual, we may be assured that he was acting from a higher impulse than fashion. Our children morally grow, too, by what they see around them: the eye is the purveyor to the mind - this fact in itself, if from no other motive, should impel us to surround our dwelling-places with everything to refine taste and elevate the mind. The Aquarium may be formed in any deep glass vessel, or in a metal case with glass sides, now made for the purpose, and procurable at most of the glass warehouses. The price of the latter case of a small size is about forty shillings - what is termed at the horticultural glass warehouses a Propagating Glass forms ours. It is eighteen inches in diameter at the top, twenty inches high, and holding about eight and a half gallons of water. It is very graceful in its appearance, and far more pleasing to the eye than those with metal sides. Care must be taken in the selection that the glass be very strong and evenly made, a good shape, and clear metal. The cost of this glass would be about ten shillings and sixpence; and in our subsequent remarks, we particularly refer to a glass of this size, although the same idea can be carried out with any size glass, even one holding but a pint. 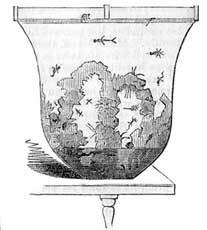 This glass inverted, a stand, or ring if we may so term it, of strong beech-wood, ten inches in diameter inside, with firm legs about six inches high, is to be let in the same, and which may be procured at any wood-turner's for one shilling and sixpence; a small groove being desirable at the inner edge of the stand. In this groove, or round it, place a piece of india rubber tubing with a bit of cord passed through it, and by tying the tubing down with thread, your glass will rest entirely on it. This precaution is not absolutely necessary, but certainly adds to the security,- the weight of water, grotto-work, &c., being considerable. When the glass is evenly placed on the stand, tie four pieces of tape firmly round the neck of it and the legs of the stand, they holding it quite secure. The taste and skill of the constructor must now be exercised on the grotto-work; and although the fingers may be, from time to time, slightly soiled with the cement, the more attention devoted to this part, the more pleasing the result when filled with water. Portland cement (sixpennyworth), procurable at any builder's or cement wharf, is the best. Before using it, we advise mixing about one pint of it to a workable consistence, and then pour the whole into the bottom of the glass. Although it will not adhere to the glass, it will form a flat bed, on which can be placed and fixed the grotto-work, when finished. A piece of waste stone from a pottery - flint or any stone - about seven inches square and four inches deep, forms a good foundation for the other fine work. Now, any varieties of small shells prove useful, tiny pieces of glass, flint, coral, or any other valueless trifles that may be found in the morning walk, prove additions to the grotto, in the formation of which several things must be borne in mind: - fix a very small quantity of cement at a time; build on this piece of stone; and if the patience and skill of the builder can devise two rude arches rising from each side and the middle of the stone, so as to see through them, they will be found very effective. Do not forget the magnifying power, as each. shell or stone will appear fully double its size when seen through the glass in the water. You must not hurry the cementing together, and let each piece, as done, stand one day. When completed, the whole can be lifted by the bottom large stone into the glass, and then cemented on its bed. The water-plants fallow next: Valliseria, Anacharis, and a few small waterlilies, are what we have used. These can be obtained, with other varieties, at Kennedy's Conservatory, Covent-garden Market: a few roots of Vallisneria (say two shillings' worth), and a shilling's worth of Annacharis, will be sufficient. A good quantity of small round gravel-stones, not larger than a bean, must now be found; or, if possible, sea-side pebbles, well washed, are better; for, being all round, they will not injure the plants. Place a layer of these stones at the bottom, and arrange the Vallisneria round the sides according to taste, placing the roots in a little silver sand, and covering them over with more of the stones, forming a level bed about two inches deep. The water may now be gently poured in, filling nearly to the top. After you have broken the Anacharis in several pieces, drill a small hole in a few common shells, and pull each piece of the Anacharis a little way through the hole in the shell; then drop each, with the shell, into the water, according to taste. This will keep it from rising to the top, and it will grow in that form very rapidly. The little scavengers, or water-snails, to be purchased at the same place as the plants, next claim attention; and our experience tells us, in the purchase of these mainly depends the success or failure of our Vivarium. The Planorbis Corneus is the one found by us to answer; and for the size glass in question we have about sixty, so that eight may be taken as an average quantity to one gallon of water. The tenants you mean to accept may now “take possession." Minnows, gold and silver fish, very small carp and dace, we recommend; but there are innumerable spiders, beetles, and other diminutive-looking reptiles sold, which, to our thinking, are anything but pleasing. As a cover to the whole, place a flat circle of glass on the top of the Vivarium, and which, with the cover, may be purchased at Claudet and Houghton's, Holborn. Let the cover be supported by four black painted corks, with slits cut in them, so as to fix on the edge of the glass, leaving a vacuum of one inch between. This not only keeps the dust of the room from the water, while it admits the air, but serves as a table for any other ornaments. We now require the assistance of our fair readers; and an excellent opportunity presents itself for displaying their taste either in knitting, crochet, or embroidery, in constructing an antimacassar for the stand. We prefer a white trimming, with deep fringe reaching to the floor; but we submit to the taste of the ladies in this last ornament, only advising that it should be made loose, in order that it may be slipped on and off easily, for the convenience of washing, and also that it should be fastened at the bottom of the glass with elastic. The Aquarium is now completed, at a cost of less than twenty shillings; and the amateur will be fully compensated for time and trouble bestowed on it. Of course, there is no limit to the plants and insects that might be introduced by those who have the means and inclination; but our purpose has been to produce this interesting acquisition to home at small cost; and I have now before me an article made by my own hands, that is ever some object of interest and information to me and my little household.